Professional OpenTX 2.2 Manuals are available! We are very excited to announce our new Open TX 2.2 Manual for the Taranis Plus (and now the Q X7) is in stock and available for purchase! The manual has been in the works for a long time and should really help folks that are having issues wrapping their heads around the radio. Proceeds from the manual go to the author (so he will be motivated to keep writing these manuals, and donations to the OpenTX team and Open TX University since they helped with the proofing. Thanks to everyone that participated, this will really help a lot of folks! Aloft Hobbies makes no profit from the sale of this printed manual. FrSky Horus Info - The cleaner version! I have been asked to maintain a blog about the Horus as the public thread was going off topic a lot. I will try and keep this one on topic and delete off topic content as best as I can. I stay pretty busy these days, but I will do my best. New Aloft Hobbies web site is up! We tried to make it faster, cleaner and smoother whenever possible. There is a lot of power behind the scenes! Heck, I'm proud of our new search feature, if you ever used our old search, you will understand why. But we aren't done yet, we will be adding features and fine tuning the site over time. More shipping options, more products, more technical blogs, etc! We are never at rest here, and are always trying to add to the hobby, and make your experiences better! This is just a small step in that direction. Alright, it is that time of the year again and FrSky has flown a great distance to show off their products at the Toledo Hobby Expo! I'll try and post up some pics and info here much as I have at the past shows. The Toledo show is always a bit chaotic as we get so much traffic in the booth, but I will do my best to check in here at least once a day, hopefully more. Right now I have to charge up some Taranis for a long day on the floor. Sadly our Single Stick Taranis prototype did not make it to the show as it is currently lost in shipping somewhere. No worries, FrSky brought some of other goodies. Thought it was time to start my own blog on our largest project to date. Here is a look at the prototype we took to the AMA Expo back in mid January. This is basically a bone stock FrSky Taranis transmitter that we have put in our own case, and modified the stock gimbal from the Taranis with metal cross bars, stronger springs, and of course the third axis for yaw/rudder. For those that may be new to the Taranis, it is a full telemetry radio with about every feature you can think of. It has 16 channels, and can be expanded to 32 channels. It is a very safe radio with RSSI monitoring, this means the radio is always checking the received signal strength at the receiver, if it gets low for any reason, the radio will talk to you. Yes, the radio also has full speech, and very nice feature. It can read you telemetry, tell you what switch you just hit, warn you when a battery is getting low, etc. No need to look at the screen during flight. In terms of mixing, this radio can do it all. Chances are, if you can think of something you would like to mix, this radio should be able to do it. With that said, the radio can be a little tricky to learn, but there are a lot of helpful folks on the internet, and a lot of great videos. Keep it simple at first and slowly grow into the more powerful capabilities as you become more comfortable with it. Vote for Aloft Hobbies 2014 Terry Awards! Please place a vote for Aloft Hobbies for the 2014 Vendor Award! Simple, just click on this link, and cast your vote. Would really mean a lot to us to win this. While you are at it, FrSky could use votes in the other 2 Terry awards categories. The Best New Technology vote splits our votes between FrSky SmartPort and OpenTX. Turns out we can vote for multiples, so vote for both. Thanks for considering these votes! Would be amazing to get a landslide win on the Terry Awards!! Thanks for a great year. Very much looking forward to next year! Just a quick post to start this off with. I'm in Chicago to help FrSky at the iHobby show and I just got to play with some new toys. I have to say that I am very impressed. I'll snap some pictures and share some details in the coming days, but for now, rest assured that FrSky has been very busy working on new toys for us all. I need to get some sleep, but will update this with details as soon as I can. We are seeing a lot of folks that want to add a custom look to their Taranis. This can be done by stripping down your existing radio and painting the shell, but many have found it a lot easier to buy a replacement shell and paint it. Needless to say this makes things faster and a little less stressful. New shells are available here. (click) Another option is to buy one of the hydro dipped cases we offer in a number of popular styles. We will only be swapping out the front of the radio shell. This is far easier and requires no soldering, cutting, etc. We do not recommend changing out the back of your radio shell due to the added complexity. We also do not recommend this swap if you are not comfortable messing around inside electronic devices. You do risk damage to your radio following this guide. This swap is not for everyone! Medium phillips, 2.5mm allen wrench for the gimbal screws and I use a special driver for the switch nuts, but a couple of small blade screw drivers can be used to remove the switch nuts. That is about it. A little tape comes in handy. I use a special electric driver that will not over torque screws going into plastic! A Taranis you want to convert. A sticker set, navigation buttons and a new LCD window will make life much easier. I'll be updating this blog with details of the new FrSky transmitter and other interesting bits from the show. Please feel free to post questions and comments here and I'll do my best to respond. If you plan to visit the expo, please stop by, we will be in booths 120 & 121. FrSky will be flying in with some great new products and several of their staff. We are looking forward to bringing FrSky news to all of our friends here on RC Groups. A little teaser of one of the trade show graphics we developed with FrSky. Aloft Hobbies is very proud to offer the FrSky (pronounced Free Sky) radio systems. We stock the entire line of FrSky products, and are happy to be able to offer you these at some of the best prices in the world, and for sure the cheapest and fastest shipping in the USA. Don't worry, we also take excellent care of our international customers. If you are looking for the safest radio system available today, or are sick of paying high prices for receivers, than FrSky is the system for you. Sure, FrSky offers one of the most cutting edge systems available today, but it is also one of the safest systems thanks to it's telemetry system with RSSI. How would you like to know how strong your signal is at your receiver while you are flying? Or better yet, how would you like your transmitter to sound an alarm if the receiver is reporting a weak signal? That is what RSSI does for you, and that is what makes this system so safe. Without RSSI your left scratching your head while wondering why your plane crashed. With RSSI, you are warned before the issue becomes critical. What else does this FrSky system do? It does a lot more! If it only reported RSSI, that would be fine, but FrSky has packed a lot more into this system. Now you can monitor temperatures, voltages, amps, watts, lipo batteries, fuel levels, GPS, variometer, accelerometer, and more! At Aloft Hobbies we try and carry a lot of goodies to make your builds go easier, and keep the prices down for you! New Stuff laminating film is a great example. We sell it by the foot on 18" wide rolls. We have all 4 of the popular weights in stock, and ready to go. And like all of our other products, we have very reasonable and fast shipping on this film. How about lead shot that is sold by the pound? We got frustrated trying to find affordable lead for a recent project. We had raided all of our old tire weights and fishing weights, and still needed a few more pounds. After a long search we finally found affordable lead, but we had to BUY a lot of it.. Now you can enjoy the savings, but not be forced into buying a ton a lead at a time. We have carbon tow at a VERY reasonable rate. Every one that places an order with us should grab some tow as we are always finding new uses for it! It is easy to glue this into most any structure and make a nice stiff, crash resistant structure. Keep an eye out as we continue to offer more and more products in this section. Thanks to a great relationship with KST, we are able to offer these beautiful servos at amazing prices! We have been very impressed with these servos, especially when you consider how reasonably priced they are!! We just lowered our prices even more..
We simply were not happy being the lowest price in the world on these servos, so we lowered our prices even more! Most are just $24 now!! That is an unheard of price.. Especially with our fast and very affordable shipping options. Nearly 50% of our sales on these servos go overseas, it is time for our domestic customers to fall in love with these little gems too. Genesis 60" is back and better! Our original Genesis was great, but we thought we could offer an even better plane. To start with we now have a 2 piece slip on wing, no more bolts. We also cleaned up the nose shape, and added some length to the fuselage. All while keeping all of the great qualities of the original, a plane that loves to be pushed hard, refuses to tip stall, and takes a good amount of abuse without a worry. The Genesis makes an excellent first mouldie, or a wonderful sport slope ship. Or, cut off the nose and glue in the provided firewall and convert this plane into a hot liner! You will not be let down by the Genesis, just read some of the reviews on this plane, and draw your own conclusion, these things are FUN! I'll always have a Genesis in my collection. Aloft Hobbies is excited to offer Top Models kits at great prices, including international locations! If we don't already carry the Top Model plane or product you are looking for, please ask, we think you will love our prices! Another really cool plane, I'll be adding one of these to my fleet for sure! Small enough that it can easily transport without pulling apart, but should be a real riot on the slopes. Comes with a wheel for the belly. Aero balanced elevator and rudder. 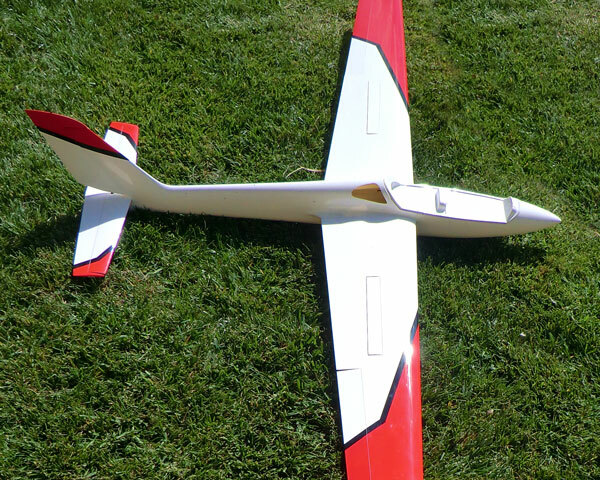 Thought I'd show off our newest glider to be added to our lineup, the new 2 meter Fox. I think you will all agree, this is a very handsome plane! I must admit, I have a real weakness for Foxes. Something about the lines on this glider always makes me want to go out to the slopes! Gliders!! and things that fly.